I arrived at the Hilton Omaha to prepare for my first event as the team lead. Diane, the guru of all-things-events and my mentor, had instructed me on the run-down. I was in charge of pre-conference check-ins and general setup until she arrived. Everything had to be perfect; this was my test. Our meeting was a leadership and strategy conference for science and engineering executives. We had done the meeting before, but this year we were trying something new—a “Power of Perspectives” discussion panel comprised of local experts and executives. The other new element was the location: Omaha. 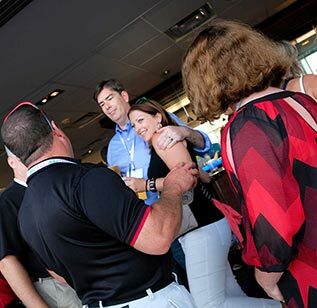 So, we were working closely with Visit Omaha to ensure the event went off without a hitch. I set up my office in the conference room and noticed we were missing a box of registration materials, and the volunteer list was about five short. Diane had trained me well, and I kept her advice running through my head. “Just imagine the experience from the attendee’s point of view.” Would they notice the missing name tags? I asked myself. Would they notice if we were a little short staffed? Knowing the answers to my questions, I set out for reinforcements. Diane would be arriving later that evening, and we were scheduled to meet in the Hilton lobby to make sure everyone was on board with our weekend’s goals. I had to get everything in order by then. I scrolled through my iPhone and clicked on my contact from the Visit Omaha team. We needed a couple more College World Series tickets for tomorrow’s event, and I knew they could help. I explained to my contact that one of our VIP clients had asked if he could bring his two sons, but she did not need further explanation. Tickets arranged. Perfect. I hung up the phone and spotted my assistant, Courtney, across the lobby scribbling furiously in her event binder. She was outfitted in her pantsuit and tennis shoes. Smart girl. “Will do, Bev,” Courtney said, writing everything down in her binder. “We are missing a box of name tags, so I’m on hold with FedEx,” I said pointing at my phone. “I’ll head upstairs to set up signage. See you in a few!” I rushed back toward the elevator with my phone glued to my ear. There was a lot to be done, but our team would pull this event together. The CHI Health Center Connects to The Hilton Omaha via glass-enclosed skywalk. Hilton Omaha offers 600 guest rooms and more than 39,000 sq ft of comfortable and flexible meeting space. Hilton Omaha’s modern interiors are comfortable and welcoming. That evening, our event team sat in the lobby waiting for our check-in meeting. I heard Diane before I saw her, the heels of her pumps clicking across the floor as she made her way toward us. She was wheeling her carry-on suitcase behind her. “Bev, what’s the status?” Diane said, coming to a halt in front of our team seated around the lobby table. “We’re all on board. Everything is as scheduled. The volunteers are accounted for, thanks to Visit Omaha, and all check-in materials arrived thirty minutes ago. Courtney reconfirmed with the vendors and our sponsors have already set up their tables in the conference room. All is in order,” I said, taking a deep breath. “Two extra just in case,” I said. “Registration opens at 8 am,” I said. Visit Omaha was responsible for putting together our local panel of experts; based on the diversity of the resumes, we all had high hopes that it would be a success. I waited outside the conference room for two hours listening in on the discussion panel until I heard the applause. You can count us in for next year. This is the best meeting that I’ve been to in a while. Diane walked over and joined our conversation. “You have to thank Bev here,” Diane said with a wide smile. “She’s the lead on this one.” I shook his hand, then Diane and I turned to walk toward the exit together. “—you have a beautiful picture,” I said smiling. And our Omaha meeting had become exactly that, a beautiful picture. “Now I’m ready for some baseball!” I said to Diane as we parted ways outside the conference room doors. From what I heard in the hallway, the main part of our event—the reflection panel—was full of high-level, innovative thinking. I was confident that everyone in that room was inspired by the conversation. So far, everything was a success. Omaha’s outdoor beauty sets the scene for a great meeting. A warm, inviting lobby is a great way to welcome attendees to Omaha. 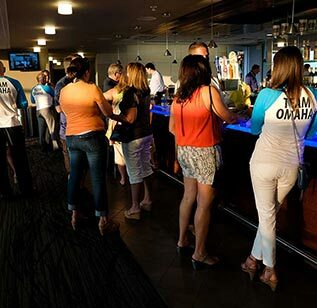 Make your meeting a home run at TD Ameritrade Park. Abstract art adds modern flair at the Hilton Omaha. A sculpture of bronze and stainless steel echoes a time when street performance and other art were commonly seen. Enjoy the undivided attention of your meeting attendees. If that meeting was electric, then the energy on the streets just outside the hotel was like a thunderstorm. 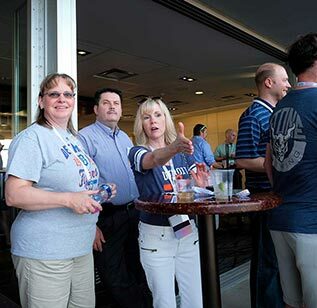 The final part of our Omaha event was a night at the ballpark with local barbecue. If that meeting was electric, then the energy on the streets just outside the hotel was like a thunderstorm. People everywhere were festively outfitted in their team’s colors: purples and reds and yellows. They were walking toward the stadium, already cheering their teams on to victory in the College World Series. The smokiness of cooked meats and the distinct grain and hops of freshly poured beers wafted by and forced me to relax and to take in a deep breath. This meeting had been a victory for my team. We had done it. And Omaha proved to be a winning partner.